I am planning a Cookie Monster cake for Blake's upcoming birthday. I wanted to do something a little different with the frosting, something cookie-related. So, I made up this frosting recipe. We tried it today on cupcakes, and oh my it was delicious! 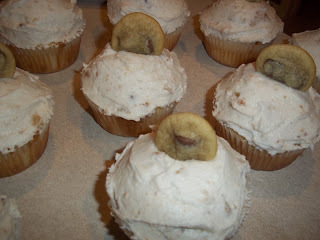 I will make this again; it's definitely a fun twist on plain ol' frosting. Cream the butter and shortening together. Stir in the powdered sugar, milk and vanilla. When it looks like frosting, dump in the chocolate chip cookies and mix well until no large pieces are left. Frost on your cake or cupcake (or just eat by the spoonful if you're like Katelee :) and enjoy!